With roots going back to 1885, Unilever (UN) was formed by the 1929 merger of Margarine Unie of the Netherlands and U.K. soapmaker Lever Brothers. The company is one of the world's largest consumer staples companies today. Unilever produces over 400 branded products used by more than 2.5 billion people each day in over 190 countries. The company sells its products through more than 30 million global retail outlets and owns 13 of the world's top 50 brands, each of which generates over 1 billion Euros in annual sales. In 2018, the company consolidated its operations into three main business segments: Personal Care, Foods & Refreshment, and Home Care. Personal Care (39% of revenue, 47% of profits): offers skincare and haircare products, deodorants, and oral care products. Foods & Refreshment (41% of revenue, 39% of profits): provides soups, bouillons, sauces, snacks, mayonnaise, salad dressings, margarines and spreads, ice creams and tea-based beverages. Home Care (20% of revenue, 14% of profits): offers home care products, including powders, liquids and capsules, soap bars, and various cleaning products. Unilever's stronger growth in emerging markets means that it will increasingly see most of its sales and profits come from the world's fastest growing economies. In May of 2018, Unilever is consolidating its headquarters to the Netherlands and will become an entirely Dutch company. The company's equity is currently split between the U.K. and the Netherlands. Consolidation will make it easier for Unilever to pursue acquisitions and divestitures since it only has to manage one set of shareholders. Consumer staples are often a dependable source of steadily rising income for investors due to the defensive nature of their business models. Even during recessions consumers still need to eat and purchase basic healthcare and home products. However, unlike many consumer staples companies, such as Procter & Gamble (PG) and Kraft Heinz (KHC), Unilever has a rather unique growth strategy. For one thing, the company is primarily focused on emerging markets, where the majority of the global population lives and where the bulk of population growth is expected to come from in the future. Unilever already has the strongest industry presence in many of the largest and most important emerging economies, where income growth is over 50% faster than in the developed world. The company's success in countries like Turkey and Argentina has led to sales growth in such markets averaging over 8% per year for the last half decade. In fact, in 85% of its markets, Unilever is the #1 or #2 leading consumer goods maker by market share. Many of the company's products and businesses have been around for decades, if not more than a century. 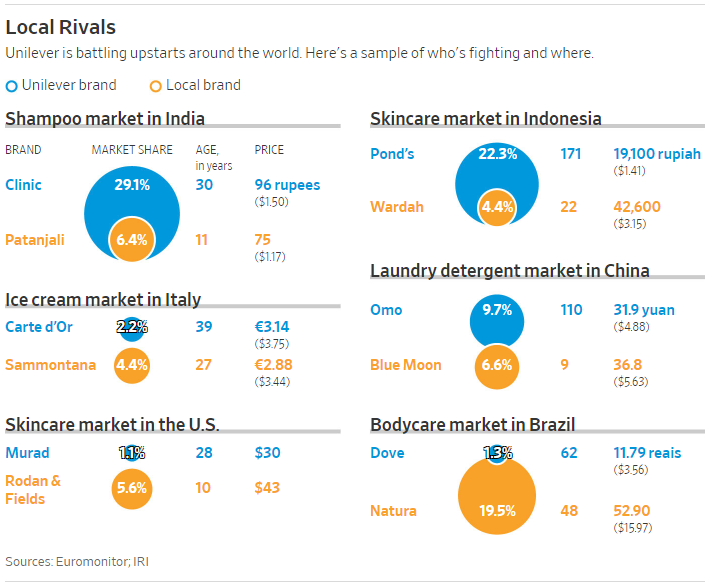 Unilever's leading market share positions have been meticulously built up over the years as the company learned to tweak its global brands to meet local tastes and preferences. The firm has also invested billions of dollars behind its brands and distribution network over the years to gain a large and loyal group of customers. Unilever's management team also attributes its success to its adoption of a 3P (people, planet, profit) philosophy that is becoming increasingly popular with young consumers around the world. 3P is seen as a long-term strategy for maximizing growth, especially in emerging markets. Unilever's focus on people, planet, and profit, rather than merely on maximizing short-term results, is supported by the company's adoption of three interrelated strategies. Improve health and well-being for more than 1 billion people by 2020 (601 million helped by end of 2017) through improved nutrition, health, and hygiene. Reduce the company's environmental footprint by 2030 (less water, CO2, waste and 100% sustainable sourcing of raw materials by 2020). Enhancing livelihoods for millions of people by 2020 by hiring locals, especially for management positions (about 80% of managers are locals). The company is also working with 1.6 million small-scale retailers and 716,000 small farmers around the world as part of its supply chain. In 2016, 18 of Unilever's top 40 brands were sustainable living brands which grew 50% faster than the company's other brands. They ultimately drove 60% of the firm's revenue growth for that year. This shows that Unilever's long-term, multi-stakeholder approach to business is paying dividends in terms of winning market share as well as creating goodwill with consumers and governments around the world. The company's environmental efforts have also reduced packaging waste, resulted in less energy use and helped the company cut costs by over 2 billion Euros in 2017, driving up operating margins to 17.5%. Management's ultimate goal is to cut 6 billion euros in costs by 2020 in order to achieve its stated goal of 20% operating margins by that year. Simply put, Unilever's more socially responsible approach to business (56% of raw materials are sourced sustainably) is demonstrating that it can serve investors well. In 2016, Unilever announced its largest restructuring in a decade under its Connected 4 Growth, or C4G, initiative. C4G is designed to create a faster, simpler organization with digitally connected end-to-end marketing, R&D, and supply chain optimization. A big focus of C4G is to enhance Unilever's organizational expertise by employing more local managers who understand the best way to source materials and stay abreast of changing consumer preferences. This would allow Unilever to more effectively tailor its products to local tastes to gain market share. C4G also streamlines the company by consolidating of its business units from four segments to three (15% reduction in middle and senior managers), refocusing on faster growing markets, and selling non-core brands. In 2017, Unilever sold its margarine spreads business to private equity group KKR for $8 billion. In addition, the company has been purchasing fast-growing "on message" brands via nearly two dozen acquisitions over three years, including 12 in 2017. These acquisitions are expected to drive an additional 1% annual revenue growth thanks to their presence in key growth markets, as well as improve the company's direct-to-consumer, or DTC, and online sales channels. DTC is a potentially great way to both increase revenue and margins because it allows companies to avoid the traditional retailer middleman and sell at full prices. DTC also allows Unilever to better access today's younger generations such as Millennials and Generation Z, who are looking for more convenient ways to shop for goods that save them time and money. In other words, Unilever is "on trend" with e-commerce which is growing worldwide at 30% per year. Unilever's own e-commerce sales were up 80% in 2017 and represent around 5% of its North American sales. A final advantage to Unilever's heavier use of DTC and online sales channels is that traditional retailers have limited shelf space. This means they are less willing to take a gamble on new products, which Unilever is constantly experimenting with. A DTC approach allows the company to test out its marketing and product offerings in limited rollouts and, if successful, expand them to traditional retailing partners. What's most impressive about Unilever's approach to growth is that one of the world's largest consumer goods giants has proven to be very nimble and entrepreneurial. This can be seen in the way it's combined its USLP and C4G approaches. C4G has created more than 200 Country Category Business Teams (CCBTs) which are multifunctional entrepreneurial units that combine marketing, R&D, customer development and supply chain expertise from local managers. Each CCBT has responsibility for its own profit and loss center, including new product designs and launches that are driven by the company's 70-20-10 strategy for product development. Specifically, 70% of products created by CCBTs are meant for global rollouts, such as Baby Dove which launched in 19 markets in 2017. Unilever wants to target the fastest growing brands and promising new ideas for the widest possible delivery across its global supply chain, maximizing its ability to generate high profits. Another 20% of products are meant for local markets, such as individual countries, and the final 10% of new products are for hyper-local markets to suit regional tastes within a country. To maximize profitability and achieve its USLP goals (maximizing sustainability), the company has integrated both strategies with its 5S cost saving strategy: smart buying, smart sourcing, smart product portfolio, smart mix and smart pricing. This strategy is designed to minimize costs across the supply chain, while taking a holistic approach to the company's product lines and sourcing to coincide with USLP goals. For example, Unilever has launched its own 17 marketing divisions in 12 countries to provide in-house campaigns which it finds can drive down marketing costs by 30% compared to using traditional ad agencies. As for marketing itself, Unilever has increased its digital media spending 120% to represent about a third of its total ad budget, better aligning its business with its younger, more tech savvy consumers, including many in emerging markets who will drive almost all of its future growth. In total, Unilever is spending about 15% of its annual revenue on advertising, which is a higher rate of marketing investment compared to its peers. However, management has shown that its disciplined and data-driven approach to advertising has helped increase its brands' pricing power and generate superior returns on invested capital. Unilever's combination of USLP, C4G, and 5S allowed it to achieve 1% volume growth and raise prices by 2.5% in 2017. While that may not sound like much, it was better performance than almost all of its global consumer goods rivals, who remain challenged by sluggish brick-and-mortar retail trends, a growing number of upstarts, and shifting consumer preferences. Management expects to deliver 3% to 5% organic sales growth in 2018, and the company remains on track to hit its 2020 operating margin goal. However, Unilever still faces several potential challenges. First, income investors should note that Unilever is based in the Netherlands. Therefore, U.S. investors face a 15% dividend tax withholding. The Dutch government has recently announced it will eliminate dividend tax withholdings in 2019 but until then any shares held in taxable accounts (IRAs and 401Ks are exempt) will face this withholding tax. Dividends paid to U.S. investors are also converted to U.S. dollars, which can cause the amount of dividends received to be volatile depending on fluctuations in currency exchange rates. As for company-specific risks, Unilever's results can be impacted any given quarter by currency exchange rate fluctuations (a stronger Euro reduces reported sales and profits), commodity price volatility (raising prices to offset higher input costs isn't as easy as it used to be in the consumer goods sector), and economic conditions in emerging markets (see the dip in volume growth below). However, none of these factors should affect Unilever's long-term earnings power. A more significant risk to consider is Unilever's acquisition strategy. The company has acquired over 20 businesses since 2015 and will be better positioned to pursue a very large deal once it consolidates its headquarters later this year. With growth challenges intensifying across the consumer staples space, pressure is building to consolidate and become more efficient. Management may look to make a big acquisition to grow in on-trend categories and cut costs, creating risks that Unilever overpays for a "hot" new brand and fails to deliver on targeted synergies. In addition, while Unilever's strong focus on emerging markets gives it one of the most attractive growth runways in the industry, it also presents risk. Most notably, the company faces meaningful competition from local brands, many of whom have stronger market share positions in certain categories. As consumers' buying habits (more spending online) and consumption preferences (healthier, more local offerings) continue evolving faster than ever, Unilever will need to become increasingly agile and lean to keep its product portfolio relevant. The firm appears to be pulling the right levers (investing more in digital, hiring local managers, innovating faster), but a company of this size is always going to move at a relatively slow pace compared to upstarts. For now, Unilever appears to have the financial firepower, geographic reach, product diversification, and somewhat decentralized operating structure to remain relevant for the long term. However, investors will want to continue watching the firm's ability to maintain and grow its global market share over the years ahead. Unilever has proven itself to be one of the most innovative and adaptable consumer goods companies in the world. The firm's various strategic initiatives and lengthy operating history have helped it to become the dominant name in consumer goods in most emerging economies around the world. In addition, Unilever's substantial economies of scale, sizable portfolio of megabrands, innovative approach to product development and marketing, and access to low-cost capital result in an extremely durable business. When combined with the company's emerging markets exposure, Unilever represents a potentially attractive dividend investment with a long runway for growth.